Hold the presses! Here's the sensational story of the birth of investigative journalism in America. At the turn of the 20th century, news reporters and monthly magazines collaborate to create a new kind of journalism—in-depth, serialized exposés of corporate, labor, and political corruption. Many of these stories become instant bestsellers in book format: books like The Jungle, Upton Sinclair's classic account of corruption in the meat-packing industry. Ann Bausum's dramatic narrative follows a generation of dedicated journalists who force responsible changes in industry and politics as America thrives. 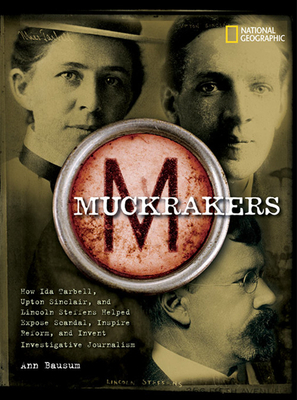 Muckrakers is the inside story of public-spirited journalism right through its evolution, with profiles of latter-day practitioners like Woodward and Bernstein and today's Internet bloggers. Ann Bausum's storytelling savvy will engage and inspire young people to cherish age-old values such as truth and public accountability. Muckrakers is the scoop on American journalism. Ann Bausum is the daughter of a history professor, and she grew up with a love of American history and a passion for research. She is an award-winning author who has published six other titles for National Geographic Children’s Books, including the acclaimed Sibert Honor Book Freedom Riders. Another of her titles, With Courage and Cloth, won the Jane Addams Children’s Book Award for Older Children. She lives in Beloit, WI. Visit Ann Bausum at her Web site: www.annbausum.com.